ESP has vast experience in the area of access control and can recommend a suitable system from the many we regularly install. Whether it is to stop unwanted intruders passing the reception area unnoticed or restricting access to certain areas within a building, we have the product to suit your circumstances. ESP access systems can be push button, keypad coded, swipe card or operated using an electronic fob and scaled from single installations to major building systems. 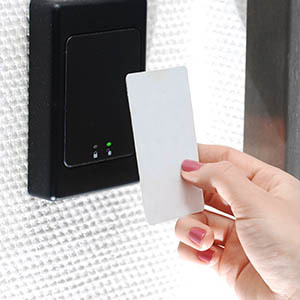 Card Access Systems require that anyone who has access to a particular area carries about them a swipe or proximity card which is offered up to a reader head. Swipe cards as the name suggests, requires that the user swipe the card through the reader head to gain access. 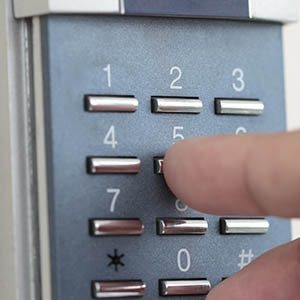 Some swipe systems incorporate numeric keypads for added security. Proximity readers on the other hand, require only that the user waves a tag or token in front of a reader. This type of system is similar in operation to that used in many shops to detect shoplifting. Because there are no moving parts or slots that can be tampered with proximity systems offer the ultimate solution for protecting external doors. They are highly vandal resistant and in many cases the reader can be located within the protected premises, offering an even greater level of physical protection. PC based systems: As with all security systems the key to effective Access Control is good management. A system which can be programmed centrally through a standard desktop PC offers the ultimate management solution. PC based systems give the operator an overview of the security of the premises. They can incorporate any of the above devices and media types in one simple to manage system, print reports on who has access and who has been into a particular area. Access to particular areas can be granted by security level or only during specific time periods. In the event of a fire or other emergency an override facility can be programmed to unlock all doors automatically to ensure the safety of the occupants.